User-friendly, laminating and mounting. Laminate, mount and encapsulate in one pass up to 1/2 inch thick. No set up change required providing simple operations. Commercial users needing quality of finished lamination, variable speed to 10 fpm, digital controls for temperature control, inline slitters, forced air cooling, rubber rolls are spring loaded and preset for even laminating pressure. Reverse switch on motor and pressure release control on rollers making it easier to clear film. Maximum film thickness 10 mil. The H20 has the infared sensor that reads the surface temperature of the rolls. It reads the roll temperature after the laminated has been laminated, and provides a more accurate temperature sensor reading. 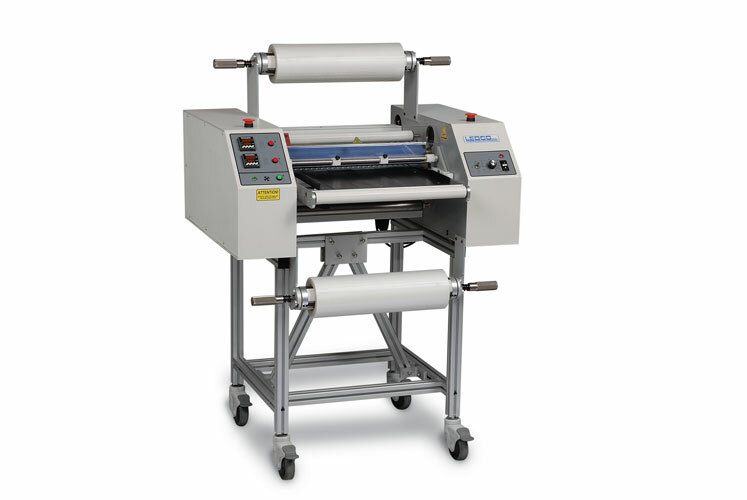 Variable speed: The laminator operates at any speed up to 10 feet / 3 meters per minute. Thicker Hot films are generally applied better at mid-range to lower speeds, while 1.5 mil hot films should be applied at mid-range to higher speeds. Precision Heat Controls: Individual top and bottom heat controls, as used on our other Digital Laminators, allow for even, consistent heating of the laminating rollers throughout the entire temperature range. Ease of cleaning: The heated silicone rubber laminating rollers, and the silicone rubber pull rollers of the laminator should be cleaned regularly. The safety shield (see below) on the laminator swings away in seconds, making it easy to clean the laminating rollers. Attached safety shield: The polycarbonate shield is clear so operators can see their work. It does not conduct heat so they’ll be protected from hot areas. It is fixed to the laminator and the machine will not run if the feed tray and safety shield are not in place. Lamination pressure: The rubber rollers are spring-loaded and preset to ensure correct and even lamination pressure. The pressure is easy to adjust if required when performing routine maintenance. Feed tray pressure strip: This strip on the front of the feed tray holds images flat as they go into the laminator, making it easier to handle the lightweight papers sometimes used in digital imaging. Supply roll tension controls: Supply roll tension is easy to adjust by simply tightening or loosening the tension control knobs on the supply roll mandrels. Ease of maintenance: The Hot Roll Digital laminator is made to last. However, some items on a laminator do wear out. Even the high-quality silicone rubber used in the rollers will lose flexibility over time. Extensive use may wear out the rollers, or an operator may cut a roller by accident. Rollers and other key parts can be changed quickly without disassembling the frame. Reverse: The reverse switch can be invaluable to help avoid problems or clear misfeeds. Right and left adjustable feed guides: Silicone rubber laminating rollers. The rollers are flexible enough to provide a good edge seal and firm enough to offer a good surface seal. A high silicone content insures a much longer average roller life. Very strong steel cores: These prevent roller flexing and insure uniform pressure across the width of the laminate, giving you the best quality lamination available in a medium-duty commercial machine. Controls to open and close the laminating rollers: The controls make threading easier and allow even heating of laminating rollers during warm-up. Roll feed tray: When laminating a very long item such as a banner, it is just about impossible to feed it in perfectly straight by hand. By rolling it up on an empty laminating film roll core and putting that core on the roll feed assembly, laminating the longest item becomes relatively easy. The roll feed assembly is especially helpful for the owners of poster printers, plotters, banner makers, and other digital output devices. 1-3 OPTIONS Extra slitter option Additional slitter heads can be installed to allow for multiple cutting of finished stock. This is a factory installed option only. Weight / Shipping Weight 250 lbs. / 450 lbs.